MoRpHeUz's Blog » Finally some news….and more Akademy! 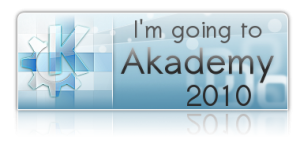 Finally some news….and more Akademy! The benefits? 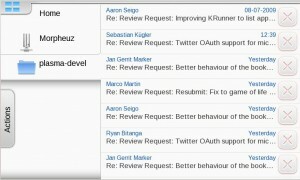 It’s easier to extend and support new services so no more bugs on bko asking for this or that service (you can *easily* implement it and provide it through kde-apps.org). Because of that, applets using the new data engine will be able to use GHNS to extend the amount of services that it uses. As soon as we unfreeze trunk, I’ll send the engine for review and then update the pastebin applet to support it. Ah, we are also using KIO inside the data engine now! 🙂 So, we also have support for “remote shares” (remote as in getting a file that is in the network – samba share for example). Good news right? At the same time I’ll be in touch with the guys working on the Qt Components project, to provide feedback and use the stuff they are getting done. This is a really important project for QML and if you ever played with QML you know what I’m talking about ;).